JJ McCabe, Carnelly House, Clarecastle,Co Clare. (File Pic). Colourful, multi-millionaire bachelor farmer, John Joseph (JJ) McCabe has beaten an assault rap over a tug of war concerning a heritage table. 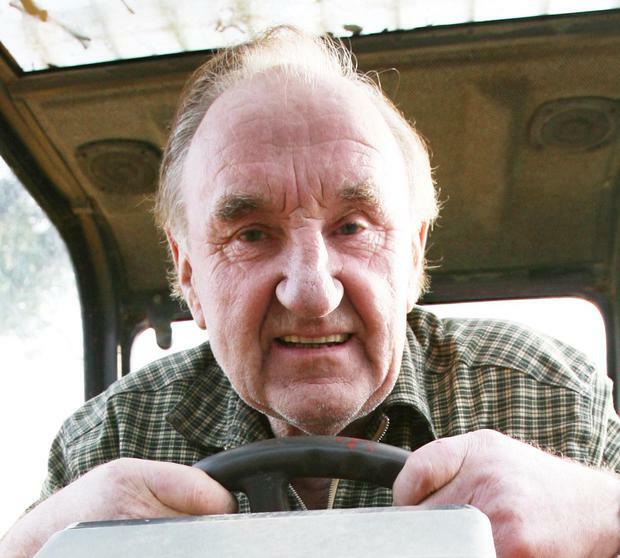 At Ennis District Court, Judge Patrick Durcan dismissed the charge against the 82-year-old Clarecastle farmer of assaulting 55 year old businessman, John Colleran at Abbey View in Clarecastle on May 12 last. After hearing evidence from Mr Colleran and his brother, Joe, over the ‘tug of war’ with Mr McCabe of Carnelly House, Clarecastle over the heritage piece, Inspector David Finnerty said that the State would be offering no further evidence. During the Celtic Tiger era, Mr McCabe scooped the largest amount from any land-deal in Clare when he sold 48 acres of land for €18.8m to a Galway developer in 2005. In evidence in the ‘tug of war’ case, John Colleran said that he was with his brother, Joe and sister, Veronica at his late father’s workshop on Saturday morning, May 12th last. John Colleran said that they there to abide by his father’s wishes to identify for sale all the material in the workshop and give the proceeds to his father’s grand-children. John Colleran said that his father had died just two weeks previous and the last piece he repaired was the pod or ‘leg’ of a heritage table. John Colleran said that he told Mr McCabe “As far as I am concerned, it is not your table, it is belonging to a man in Co Limerick”. Mr Colleran said that Mr McCabe grabbed the table and a struggle ensued. Mr Colleran said that Mr McCabe had the table in his hands and forced his way out of the garage with the table. He said that he tried to prevent Mr McCabe exiting and was driven against a trailer by Mr McCabe carrying the table and sustained a cut to his arm. Mr Colleran called the Gardai and made a statement to Gardai the following day. Joe Colleran said that Mr McCabe “grabbed the table like a rugby ball and was going for a try”. However, after Joe Colleran admitted that he also had his hands on the table with Mr McCabe when the table made contact with his brother John as he collided with the trailer, Insp Finnerty withdrew the case. On behalf of Mr McCabe, Elaine Houlihan BL said that it was simply implausible that an assault took place. Ms Houlihan said that Mr McCabe rightfully asserted that the table was his and picked up the table. Ms Houlihan said that Mr McCabe took the table and a tug of war ensued with John and Joe Colleran. She said that the man of 82 was exhausted with the tug of war with the two younger, fitter men and he left the table down and then left the property. Ms Houlihan said that Mr McCabe’s nephew came along a couple of weeks later and retrieved the table without incident from a sister of the two brothers. Ms Houlihan said that the heritage table would be an expensive item, is around 100 years old and has been in the McCabe family for a long time. John Colleran told the court that if his father knew that the table was Mr McCabe’s he would never have repaired it as they had a falling out four to five years prior to his death. Michel Colleran was aged 85 when he died in late April 2018 and Ms Houlihan told John Colleran that Mr McCabe was at Michael Colleran’s funeral over two days and sympathised with all members of the Colleran family. Ms Houlihan stated that there had been no falling out between Michael Colleran and JJMcCabe though there may have been a cooling off between them. Ms Houlihan said that the two had worked together, had been friends for 25 years and Mr McCabe had Michael Colleran to his farms where he shot game on his farms and had a vegetable garden. Ms Houlihan said that Mr McCabe “is quite wealthy in terms of property” and was approached by Michel Colleran for a €1 million loan to save John Colleran’s business when it got into trouble.